Taking a vacation can be great, but seeing our four-legged friend’s face at the doors as we head off with our packed bags can be heartbreaking. So why not bring them with you? Believe or not, several hotels now allow you to take your dogs, too. Now, we can enjoy our vacation with the entire family at the hotels in America that are most dog friendly. If you’re looking for the ultimate relaxation hotel for you and your dog than look no further. While you are enjoying the hotel’s rooftop pool and fancy cars on offer, your pooch can be soaking up a pawdicure or doggy massage. This is all before they choose a meal off the specialized dog menu that includes a dog-friendly burger or pooched salmon (gettit?). To top it all off, your little pup can enjoy all of this from the comfort of their complimentary dog bed. The Sunshine State is famous for just that – its incredible weather. So if you’re looking to soak up the rays and want your best friend there for the ride, this could be the hotel for you. The W South Beach hotel has everything you could need for your furry friends, including litter boxes, leashes, and pet beds. Plus the beach is just a short walk away meaning the entire family can enjoy fun in the sun. If you need some time to yourself, the hotel can also arrange pet sitters or dog walkers to keep your pooch company. This could possibly be doggy heaven. “Why?” we hear you scream? Sit back and let us explain. The hotel has added artificial grass over the entire rooftop to create its own puppy path to explore. 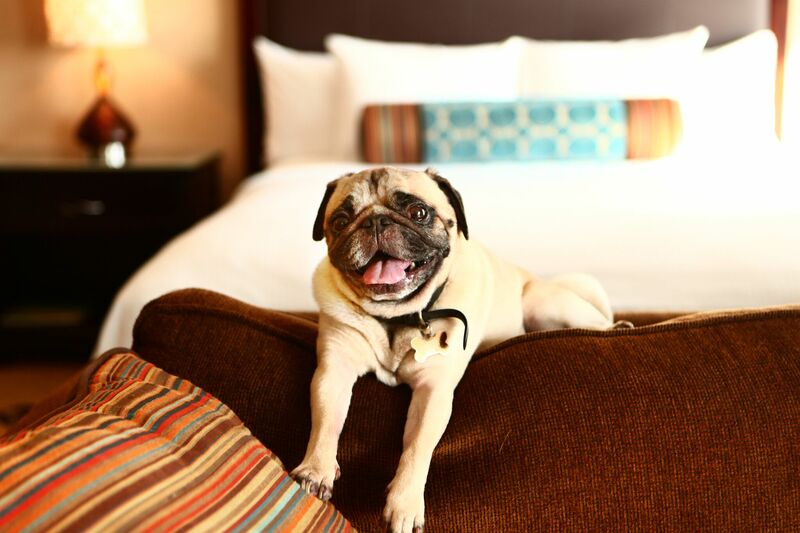 Plus, Aloft also works with the local pooch bakery that can deliver fresh-baked local treats right to your room. As if that wasn’t enough, the hotel is also located right next to a variety of mountain walks as well as many dog-friendly restaurants meaning you never have to be parted from your companion. The Topnotch Resort is perfect for those looking to give their dogs an outdoor adventure teamed with a chance to relax and unwind. Not only can you take it all the sights and sounds of the local hiking trails, but you could also sign your dog up for a spa treatment or Reiki massage. As if that wasn’t enough, the hotel has a range of dog-friendly baked goods available to snack on after all the adventures of the day. Don’t feel left out, the Topnotch Resort has plenty of treatments available for owners, too! There is no stopping these American Dog-friendly hotels. The W Hotel runs doggy yoga as well as pooch boot camp classes to get you and your little friend active. Plus, they are greeted with an exclusive welcome pack that includes treats, a toy, and a dog tag as well as a letter explaining all the pet-friendly activities in the area. If you head down to San Francisco, you could also enjoy another hotel in the chain that even offers up bedtime doggy beer! These hotels in America that are the most dog friendly almost sound too good to be true. In fact, it seems as though our four-legged friends will have an even better time than we will. No longer do we have to worry about waving goodbye to our pooches; they are part of the family too and should be there for all those special memories!